Whole roasted cauliflower makes a delicious and stunning side dish on your dinner table. If you're not a fan of cauliflower all ready, you might be after tasting one of these recipes. Savory garlic and herbs drenched in butter is an unbeatable flavor combination that elevates the humble cauliflower to a delicacy. This recipe makes a wonderful introduction to the culinary world of oven-roasted whole cauliflower. Serve it with a lovely beef roast and your tastebuds will be in seventh heaven. Remove the leaves from the cauliflower and cut the stem level with the bottom of the head so it will sit stable in the baking dish. Rinse the head in cold water and pat dry with a paper towel. 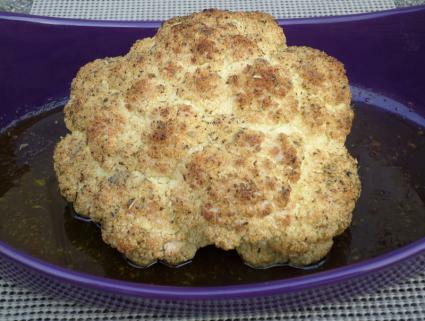 Spray the bottom of the baking/serving dish with non-stick cooking spray and place the cauliflower in the dish. In a small bowl, stir together the garlic, salt, pepper, oregano and basil. Add the softened butter to the bowl and stir with a spoon until all the ingredients are combined. Using a clean hand, rub the seasoned butter mixture all over the cauliflower and make sure it's well coated. Put the dish in the oven and bake for approximately 1 1/2 hours or until the cauliflower turns a rich, golden brown and is tender when a knife is inserted into the center. The baking time will vary a bit depending on the size of the head; small heads of cauliflower will become tender sooner than large heads, so keep an eye on the browning and test for tenderness. There are many other ways to prepare oven-roasted cauliflower. Try these flavor variations on one whole head of cauliflower and roast as directed in step 7 of the recipe above. This dish makes a good side for beef, chicken or fish. Brush the cauliflower with the olive oil and sprinkle with the salt and pepper before roasting. Serve this on the side with Tandoori chicken or lamb. Mixed the ingredients together and brush onto the cauliflower before roasting. This recipe also works well with any meat, but it makes an especially nice side dish served with pork tenderloin. Rub the softened butter all over the head of cauliflower and coat with the Parmesan cheese before roasting. Try this dish along with your favorite chicken or pork recipe. Combine all the ingredients and brush onto the cauliflower before roasting. Roasted turkey breast is the perfect pairing with this recipe, but it's also great with chicken. Combine ingredients in a small bowl and brush on cauliflower before roasting. There's a world of difference between roasting whole cauliflower and steaming or boiling it. If you want to taste this cruciferous vegetable at its best, roast it to perfection using one of these recipes.